Dernier & Hamlyn is well known among the UK’s leading interior designers for its bespoke lighting, which can be seen in a wide variety of sites including luxury homes and hotels, high end restaurants and superyachts around the world. The company is one of the few remaining British lighting manufacturers and its clients love coming to its London factory to see the designs they have previously only imagined crafted into reality by its highly skilled team of design and production experts. Award winning Dernier & Hamlyn works closely with designers and property managers to produce chandeliers, ceiling and wall lights, table lamps, lanterns and other lighting products that not only meet their design brief but also adheres to the inevitable budgetary constraints. As a specialist company Dernier & Hamlyn has a flexible attitude that can help designers however they want to work. From interior designers who know exactly what they need, and want a trusted partner to make it, to designers who need our help to turn their conceptual ideas into beautiful reality Dernie r& Hamlyn delivers. Occasionally they come across clients who’re not at all sure what they want so they take time to listen and get under the skin of the project, and then use their skill and experience to create designs, schemes and solutions that meet every aesthetic, technical and cost requirement. 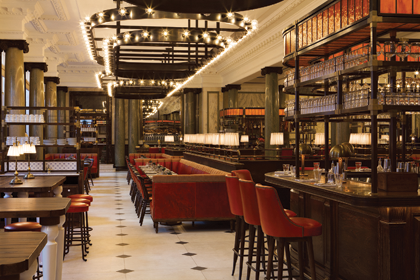 Recent projects that Dernier & Hamlyn has worked on include the Berkeley and Lanesborough hotels, the iconic Ivy and Michelin starred Fera restaurants as well as some truly stunning houses and apartments in the UK and overseas. Established in 1888, Dernier & Hamlyn has built up an exclusive archive of lighting images and reference materials that its own team and designers use to inform new lighting concepts. Sometimes this is so that it complements the design styling of an existing building and often so that designers can select the best elements from beautiful fittings from the past to create something unique that their clients will love.